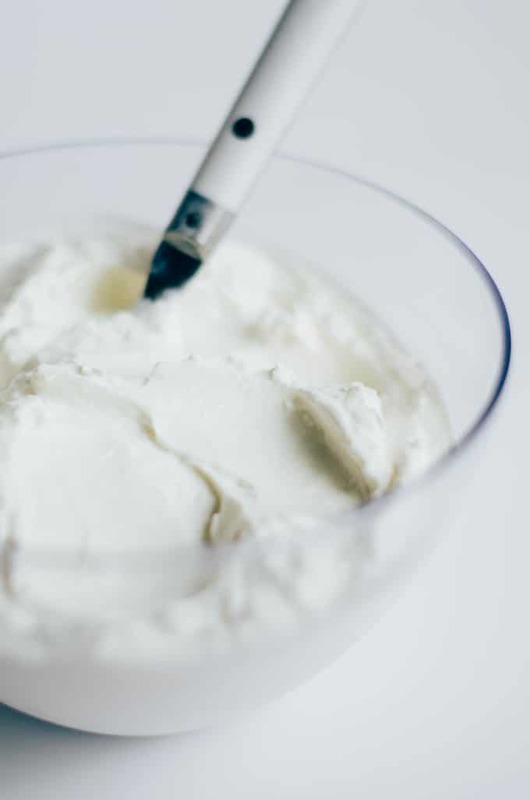 This week we’re exploring all things Greek yogurt, starting with this simple guide on how to make Greek yogurt in your oven (with just two simple ingredients)! 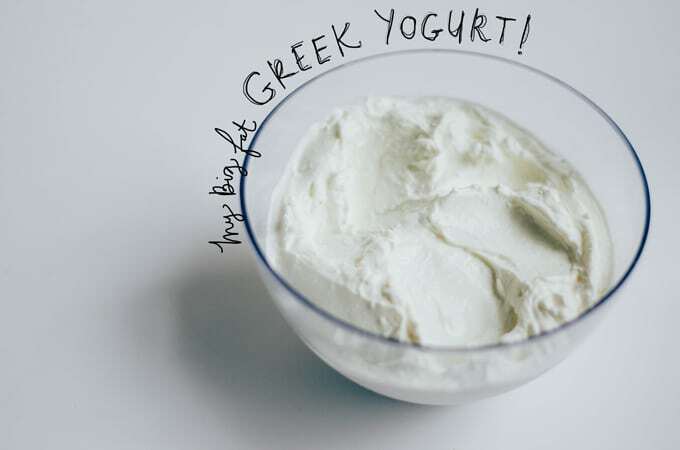 Okay, before we jump into what Greek yogurt is, let’s talk about the history of yogurt. Yay, food history! (P.S. I would watch the heck out of a show that combines Drunk History with history of food). Yogurt came to be right around the time when humans started drinking animal milk, which was just about the time when we learned to domesticate animals, so 8000 years ago. Back then, milk was stored in (brace yourself) animal stomachs. The natural enzymes and bacteria in the stomach would cause the milk to curdle and ferment, producing yogurt and cheese! 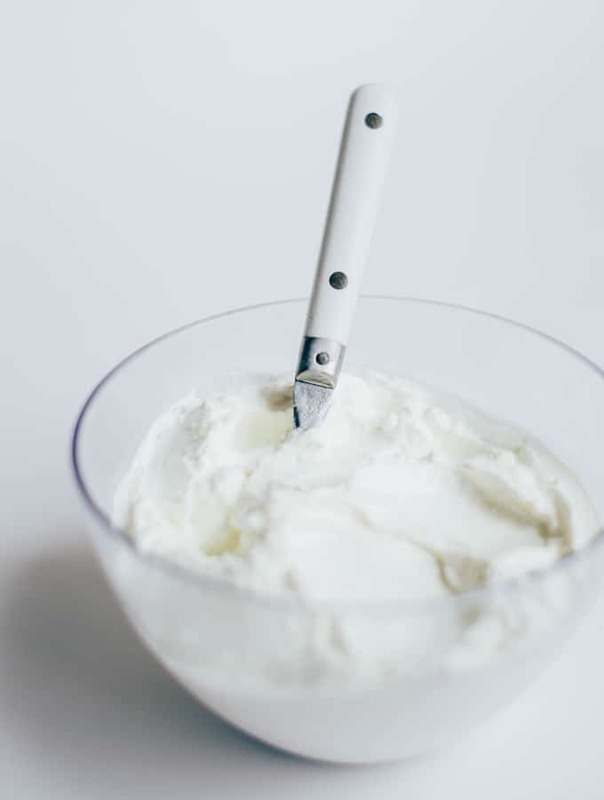 Yogurt has made it’s way into most nooks and crannies of the world, but it didn’t become popular in the U.S. until the 1950s and 60s, when health foods began to gain some traction. Yogurt, with its promise of being rich in probiotics and low in fat, became an American kitchen staple. So what is Greek yogurt? Well milk is made up of casein and whey. Casein is what curdles and is used to make cheese and yogurt, while whey is the watery substance left when the milk curdles. Greek yogurt is essentially the same as regular yogurt with the addition of one critical step. At the very end, the yogurt is strained to remove the excess watery whey, creating a thicker, more protein-dense product…Greek yogurt! So while we call this variation of yogurt “Greek yogurt” in the U.S., you may see it called “strained yogurt” in other areas of the world. 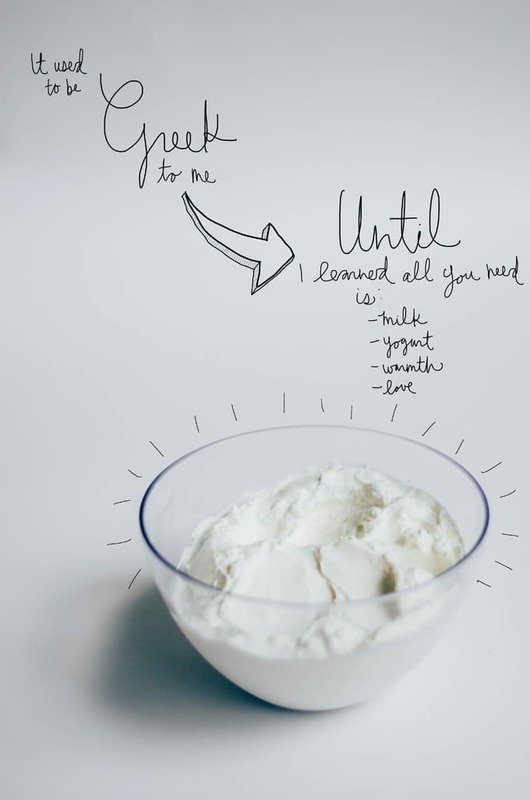 How do you make Greek Yogurt? Yogurt is a fermentation (just like our kombucha! ), meaning it’s created by adding some bacteria to a sugar-containing substance and letting the bacteria eat up the sugar. The result of fermentation is always acid, gas, or alcohol. Fermentation of milk gives us acid, making for the distinctive tart flavor of yogurt. To make Greek yogurt goes something like this. Someday I’ll have fancy things like double boilers. Until then…we make do. 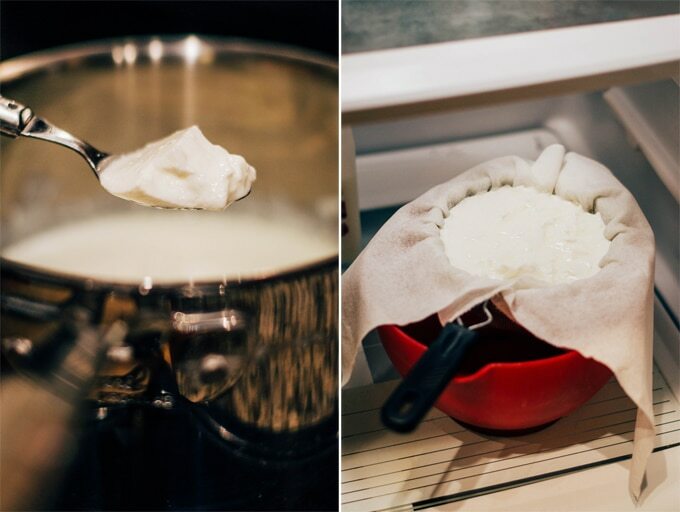 How to make Greek yogurt in your oven with just two simple ingredients! ¼ cup plain store bought yogurt ensure the container says “live” or “active” cultures, we need living bacteria to make this work! 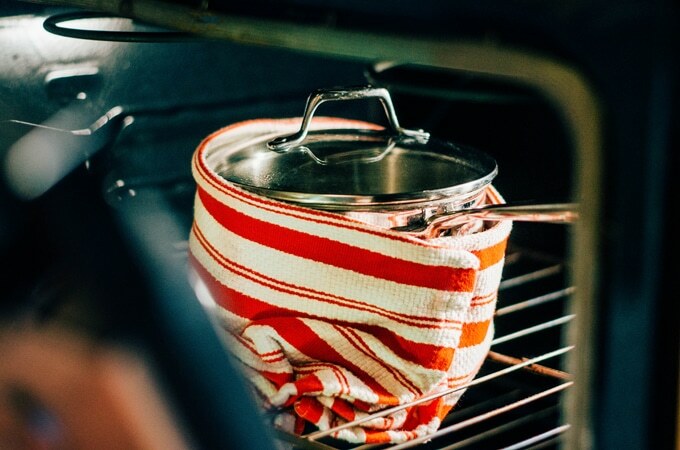 Fill a large pot ½ full with water and set over medium-high heat. Place a medium pot into the large pot of water (or use a double boiler if you have one). We’ll warm the milk this way to prevent it from burning. 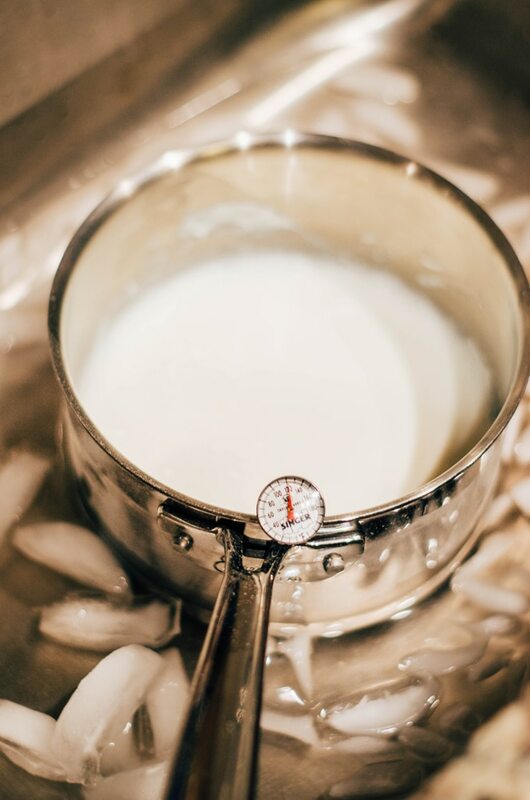 Place milk into medium pot and heat to 185-200 degrees F (85-93 C), stirring frequently to preventing a skin from forming. This should take 10 to 15 minutes. Transfer medium pot with milk to an ice bath (I filled my sink with ice and water), to cool milk to 100-110 degrees F (37-43 C). Pour about ½ cup of the warm milk into a separate clean bowl. Mix in plain store bought yogurt, stirring until yogurt is well blended. Pour this back into the pot of milk and mix well. At the end of its nap, you should open up your container to find yogurt! You can eat it like this, or strain it to make Greek yogurt. To strain, line a mesh sieve with cheesecloth (or paper towels, coffee filters etc), and pour yogurt in. 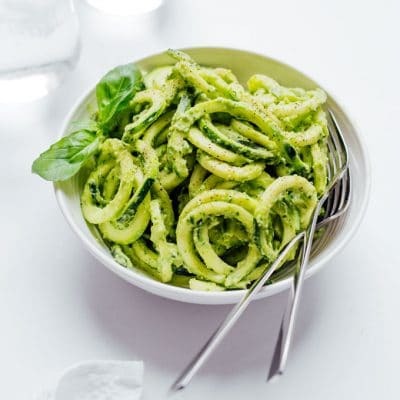 Place over a large bowl and let strain in the fridge for a few hours (or overnight), until it’s reach a consistency you like. 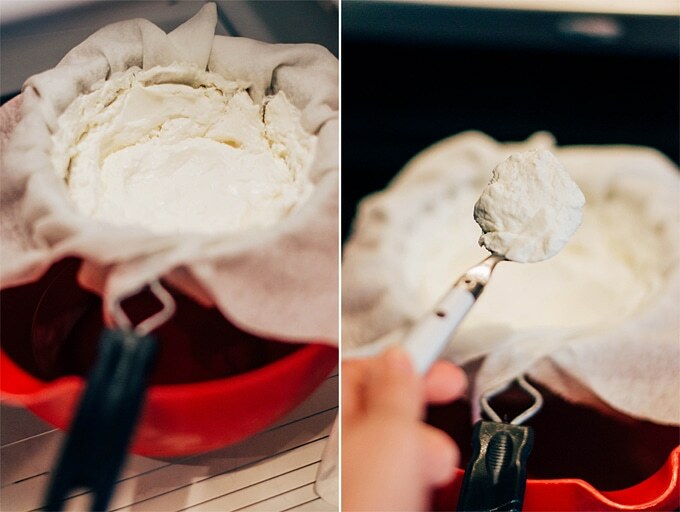 Scoop Greek yogurt from cloth and store in a clean, airtight container. *Higher fat content in milk gives the yogurt a thicker consistency. Commercial low fat yogurts often have stabilizers in them to reproduce the thick, creamy consistency we all know and love. For the purpose of making yogurt at home, it’s best to use milk higher in fat. **The oven light should be sufficient for keeping the milk warm enough for fermentation. You can also turn the oven on for 1 minute (just enough to warm things up an insy bit) every so often. We’re aiming to keep the milk/yogurt at about 100 degrees F (37 C) throughout the whole process. 22% Daily Value (DV) of Vitamin B12 (Cobalamin): A water-soluble vitamin important in brain and nervous system function as well as red blood cell formation. It is only found naturally in meat and animal products, but can be made industrially via bacterial fermentation. 19% DV of Calcium: 1% of the calcium in your body plays a vital role in vascular contraction/dilation and nerve transmission and signalling. The other 99% supports teeth and bone structure and function. Added benefit: Straining out the whey removes much of the remaining lactose left after fermentation, making Greek yogurt a good option for those with mild lactose intolerance! McGee, Harold. 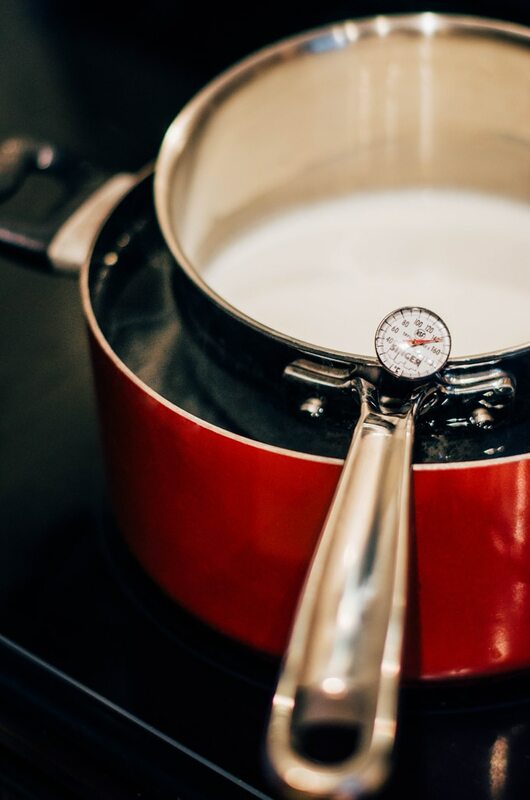 “Fresh Fermented Milks and Creams.” On Food and Cooking: The Science and Lore of the Kitchen. Completely rev. and updated ed. New York: Scribner, 2004. 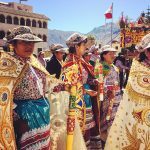 Thank you for the step-by-step photos. I want to make my own yogurt but I’m dairy-free. Can I apply the same method to plant-based milk? Right?! So many things are just so simple to make at home! Have you experimented with using lower fat milks? I love yogurt and in Iran we mostly have it savory and it’s been difficult for me to find a good yogurt here, so i guess this is going to be my new favorite! All the more reason to just make it at home! With a touch of honey and some strawberries…yum! I have to start making yogurt again! It is always better than the store bought when made at home! Aw I’m glad!! Is this about how you used to make yogurt? I’m a yogurt newbie and was quite happy with how I got it to turn out, but I’m curious what other method there may be out there! The recipe I used used a lower fat milk plus a teensy bit of powdered milk. It was so good every time! Yea I saw a few recipes with powdered milk! I figured I’d start simple, but I’ll probably try out a lower fat milk + powdered milk next time. More protein, less fat, I’m in! I need this in my life. I’ve always wanted to make my own yogurt but never have. Looks like now is the perfect time. Thanks for sharing ? Don’t we ALL need fresh made yogurt in our lives? 🙂 Happy yogurt making. Lyndsay! Bahahaha!!! I’m dying at your title. I’m Greek, like my parents are straight off the boat, and that movie was a fave. That’s totally my extended family. Can’t wait until the next one! It’s been on my list to make a plant-based yogurt! There’s a sequel coming out?! I may be going to Greece in the near future for a friend’s wedding and I hope it is everything like the movie! But yea, I’m going to aim for a lower fat yogurt next, and then eventually a plant-based version. 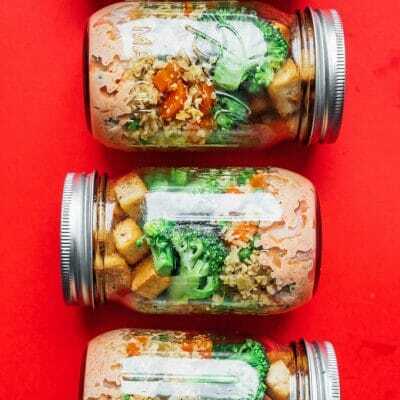 Let me know how your plant-based one turns out! 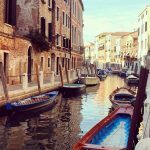 Thanks sarah for this post! Just wondering, I used to just strain balkan yogurt to get that greek yogurt texture. would this method bring better results? I love yoghurt and did not know that you can make your own! Thank you very much for sharing. This post is very informative. Thank you. 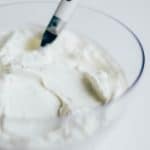 I didn’t even know there was such a thing as yogurt makers until I started researching how to make it! I panicked a bit because I started to think you needed to have one to make yogurt, but the oven light ended up being perfect 🙂 You should try it out! I keep buying Greek yogurt (good quality but frightfully expensive) it would be good to try making it myself. Thanks for sharing. Thanks to your very awesome tutorial I am now totally inspired to make my own Greek yogurt. Pinned for future reference. wait what? they stored milk in animal stomachs? am off to learn more about this, then maybe i will make some yogurt. but you need a thermometer right? you can’t just set the temperature in the oven and keep it in there? Apparently! The stomach was used as a bag (fashionable, right? ), so they stored milk in it. And I’m just imaging one day they looked inside and discovered the best thing on Earth, cheese! But yes, it’s best to use a thermometer to ensure you hit the 2 major temperature points in this process, 185ish for heating the milk and 100ish for incubating. If your oven goes as low as 100 F, by all means set it at that. Most ovens won’t go below 140 F though, which is too hot for the bacteria to make their magic happen. You could, if you don’t have a thermometer, still try. Heat the milk until it is frothy, like milk for a latte, but not boiling. Cool until it is warm enough to touch. And use the oven light method for the rest. More chance that it may be a flop but worth a shot! I’m nuts about Greek yogurt. It is an essential part of my daily diet. Wallaby Organic Aussie Greek is my favorite, and it costs me plenty. I also worry about all those plastic tubs that the local recycling entity might collect but not actually recycle. I’m going to do this. I hope I can start with a quarter cup of Wallaby Organic and go from there.